Running is a great exercise. It’s free, you can do it anywhere and it’s a good form of cardiovascular exercise. 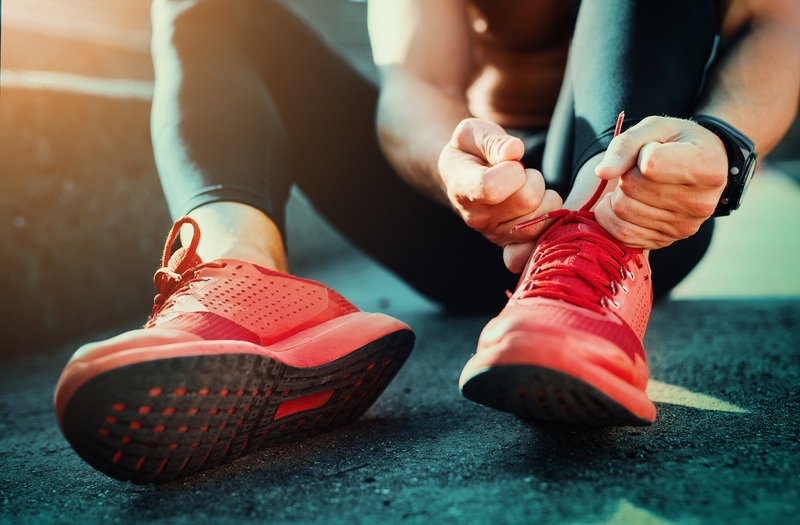 You may think that running is only for athletes, or those who are very sporty – however it’s a great exercise to undertake on your own, with friends or even with the family. Whether you’re running 10k every day, or haven’t even run for the bus since school, here are my top tips to get you training like a pro. Running requires very little equipment, but a good pair of running shoes will help improve comfort and reduce the risk of injury. Your local running shop is a great place to start, they will be able to advise which style of shoe suits your feet and running style. Trainers wear out, so replace your shoes every 300-400 miles. If you don’t warm up, you are more likely to have problems with injury. Whatever exercise you’re doing, it’s always best to spend ten minutes or so getting the blood flowing first. The best way to warm up is to walk gently for up to five minutes, then up the pace and stride length for another five; finish with some dynamic stretches like leg lifts, walking lunges and pike stretches. Avoid static stretches, as they have been linked to an increased injury risk. If you’ve not run before or not been active for a long time, it’s a good idea to build your fitness levels gently. Start with some gentle walks, increasing distance and pace as you become more accustomed to moving. A good rule when upping the distance when you walk or run, is to limit your mileage increase to 10% each week to make it sustainable. If you’re into running, no matter what age or ability you are, putting aside one session a week for strength and conditioning training will help protect you from injury. Stability is a massive must for a runner; the more stable and symmetrical you are, the less injuries you will sustain, and you’ll be able to train harder, whilst pushing yourself further. Different people will need different exercises to help work on weak areas, so always ask your coach, gym leader or PT for advice. However, some very basic strength and conditioning exercises that will help any runner are squats, lunges and planks. Many people turn up their noses at the thought of running – but it’s not all pavement pounding. To make sure running is something you want to keep doing, find the style of running that you like. There are plenty of clubs specialising in track racing, fell running, long distance, cross country, obstacle course – you name it. Club running is a great way to socialise and get the whole family involved. And if the British weather is stopping you from getting your trainers on – run indoors! Most gyms and leisure centres will have treadmills you can use. Staying hydrated is extremely important, whether you’re an elite athlete or a recreational runner. Even being slightly dehydrated can have a big impact on your performance. It can also affect you in your day to day life – causing headaches, dizziness and lethargy. Dehydration hampers recovery and puts you at a greater risk of injury. The more you exercise and the warmer it is, the more you need to drink – especially children, who dehydrate quicker than adults. When out and about or at the gym make sure you have plenty of water or low-calorie sports drinks with you, especially if you don’t have easy access to a tap or shop. It’s easy to overcomplicate nutrition when you’re training for a run or other sporting event – thinking you must eat certain things at certain times of the day. But what’s important is ensuring you’re getting a good balance of carbs, protein, some healthy fats, and some fruit and vegetables. Just as you would in a normal day. Good nutrition also plays an important part of in recovery. It’s a good idea to wait for two hours a full meal after eating before running – otherwise you may suffer from abdominal cramps, bloating and nausea. If you’re a serious runner and are training hard, the key for any improvement is allowing time for recovery and adaptation. Plan in specific hard days and specific easier days – if you don’t have those easier days, then you’re not recovering enough and allowing your body to adapt. You won’t be able to perform as well and will be susceptible to an increased risk of injury and exhaustion.